Sreenivasan’s research expertise is fluid dynamics in a broad sense, and has touched a few other areas of applied physics. He is the author of some 240 research papers, has supervised about 30 Ph.D. theses and mentored numerous students at Yale and elsewhere. He has served the scientific community in several capacities, in both official and scholarly capacities. He has been instrumental in creating new entities such as the Topical Group in Statistical and Nonlinear Physics of the American Physical Society. He is greatly interested in human rights, especially as they apply to scientists, and presently holds a unique position with respect to international science and science policy, especially in developing countries. 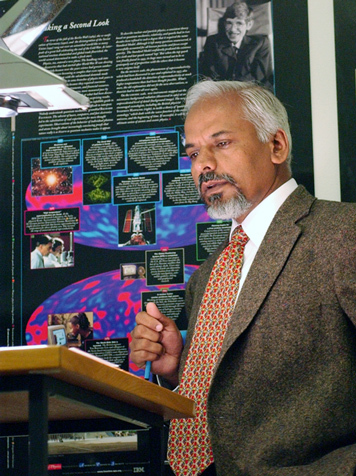 Among the academies to which Sreenivasan has been elected are the US National Academy of Sciences and the US National Academy of Engineering, the American Academy of Arts and Sciences, the Indian Academy of Sciences and the Indian National Science Academy, the Academy of Sciences for the Developing World (TWAS), and the African Academy of Sciences. His honors include Guggenheim Fellowship, Otto Laporte Memorial Award of American Physical Society, TWAS Medal Lecture in Engineering Science, Distinguished Alumnus Award and Centennial Professorship of the Indian Institute of Science, Sir C.V. Raman Visiting Professorship of the Indian Academy of Sciences, the International Prize and Gold Medal in memory of Professors Modesto Panetti and Carlo Ferrari, Academia delle Scienze di Torino, Italy, National Order of Scientific Merit (the highest scientific honor) by the Brazilian Government and the Academy of Sciences, UNESCO Medal for Promoting International Scientific Cooperation and World Peace from the World Heritage Centre, Florence, Italy, President Dr. Zakir Husain Memorial Award from the Duty Society and the Indian Society of Applied and Industrial Mathematics, Honorary Member, Academia Torre e Tasso, Duino-Aurisina, Trieste, Italy, the Melvin Jones Fellow of the Lions Club (for humanitarian service), the Dwight Nicholson Medal of the American Physical Society for human outreach, and the 2009 Nusselt-Reynolds Prize from the Assembly of World Conference on Experimental Heat Transfer, Fluid Mechanics and Thermodynamics. He has delivered a number of named lectures, is Fellow of several learned societies, and the recipient of three honorary doctorates.